Many Pokémon are finding themselves in trouble and it's up to you and your rescue team to go and save them in this dungeon crawling spin-off from Chunsoft. 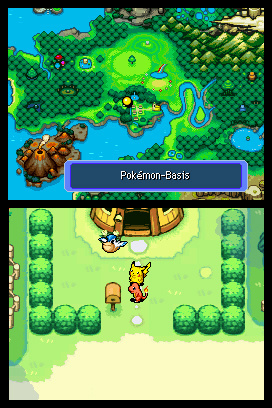 Released for the DS in 2006, Pokémon Mystery Dungeon: Blue Rescue Team sees you fighting ill-tempered Pokémon as you search a randomly generated floor for the staircase that will lead you to the next randomly generated floor where there's another staircase to find. It's a process that repeats until you've saved the unfortunate creatures and it's a process you'll be engaged in a lot as you work your way through the game. Whilst things can get a bit samey there's a fun story running throughout that keeps you playing as you try to figure out the answers to some questions, not least of which is why you (a human) woke up one morning as a Pokémon. 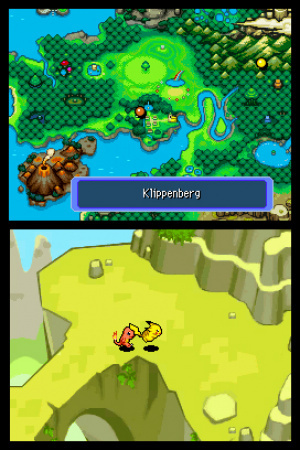 The wide range of Pokémon (the first three generations) and a number of locations adds some visual variety. It may not make the most of the DS' graphical capabilities but there are some good touches like shadows from overhead clouds, and the colourful visuals work well. If it looks like a Game Boy Advance game that's because it is a Game Boy Advance game. 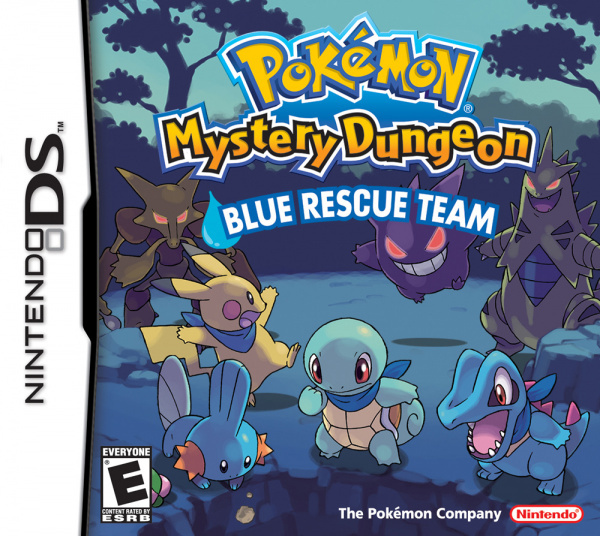 Pokémon Mystery Dungeon: Red Rescue Team arrived on Nintendo's sixth generation handheld at the same as this game and it too is now available on Wii U via the European and Oceanic eShops. For a DS owner back in 2006, this Blue edition was the version of the game to go for. 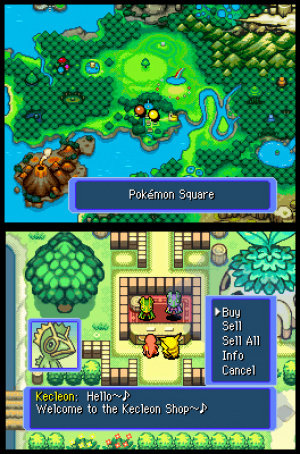 Thanks to the presence of the GBA slot the Red version was playable on the dual-screen portable, but the DS release made use of its second screen to display information that was otherwise in a menu (team info) or obscuring the action (the map) and had touch controls available too. For Wii U owners the decision is trickier as there isn't an ideal way to display the two screens; it costs a little more too. Dive into the screen settings menu and there are a number of display options, although only a few are of any use. If you are playing exclusively on the GamePad and favour the touch controls the vertical options work well, providing an experience not dissimilar to the original hardware. Unless you are prepared to turn your TV on its side this is not ideal for big-screen play however, and here Nintendo Life recommends the "Touch Screen Focus" option that places the two displays on one screen. The touchscreen is where the action happens and it is displayed three-times the size of the "top screen" that is showing the map/stats. Although this gives you the largest view of the action, it should be noted it is not as large as the single screen display of the Red Rescue Team version. There are also a few options for what you'd like displayed on that second screen. The map obscuring the action wasn't a big problem on the GBA and here you can choose to have it displayed the same way, opting for a bit more team information on the top screen. Once you've played around and found a display option you're happy with, the experience is (as you'd expect) the same as the GBA edition with the same thrills and the same repetitive gameplay. Both versions have a handful of exclusive Pokémon but you can get missions involving those from the other game by entering "Wonder Mail" codes that appear on each job listing. At the beginning of your rescue team career things can be tougher than you'd like, but once you've levelled up a bit and acquired some items to help you out or attack your enemies with, things become a bit easier. When you are on missions you may find an enemy wishes to join your team and these additional team members are very helpful in your quest. You need to purchase friend areas for them to stay in – available from a friendly Wigglytuff in the town square. That's not the only service in town, your hard-earned Poké (they really should have called it Pokémoney) can be used to buy items or to link together moves you (or your team members) have learned. You can also store your items and money; that's a good idea if you have a tricky mission coming up. With a variety of enemies to fight, a selection of locales, different weather conditions and the moves you can learn (and combine), there's some variety in the game. There's a lot of dungeon-crawling action to keep you busy en route to the ending – and when you've watched that, there's even more for you. Surprisingly the game remains interesting, in part thanks to the entertaining storyline that may have you rushing off to a mission in the hopes of finding out what happens next. You'll meet other rescue teams in the game including the heroic Team A.C.T. (Alakazam, Charizard, Tyranitar) and the not-so-heroic Team Meanies, led by Gengar who at one point causes you and your partner Pokémon to become fugitives. The missions may get repetitive, but fun moments (feigning illness to get out of a job) make it more tolerable. Fail on a mission and you lose your money and items, but you can call upon a friend (with either version of the game) to come and rescue you, so long as they are playing in the same language as you. The original release featured a few ways to go rescue (or be rescued by) another owner of the game, but the only way to do it in this Virtual Console release is the password method. SOS, A-OK and thank you (with optional present) messages each require a 54 character password; iy'd fiddly, but less so with a stylus. As well as inputting lengthy passwords, you can also use touch controls throughout the game. Tap where you want to walk, tap on someone to either talk to them (friend) or attack (foe). Once you've learned a few moves and picked up a few items, selecting them from the menus is a few quick taps away. If you have linked moves available a double-tap will perform them and if you're an impatient sort a double-tap and hold will let you run about the screen. The regular controls are fine, but if you're partaking in some Off-TV play the touch controls work wonderfully. The randomly generated nature of the dungeon floors means you're never sure where that next staircase will be: it could be on the last part of the floor you explore or it could be right next to your start point. You shouldn't always take a quickly found staircase however. Assuming your party is healthy it can be worth spending a few moments getting the points required to level up which will make your journey through the game a lot smoother. There are tough missions in the game but put together a decent team, be sensible with your items and then with a bit of luck (or a bit of restore point abuse) you will make it through. 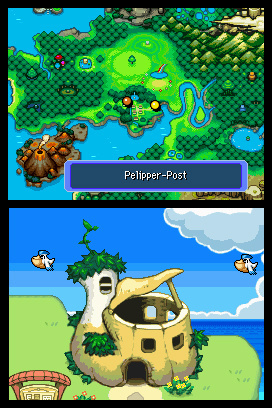 Pokémon Mystery Dungeon: Blue Rescue Team's second screen is useful, although it comes at the cost of a smaller main screen compared to the GBA counterpart. There are also touchscreen controls that work well whether you are using them for menu navigation or opting to play the whole game with a stylus. There's a lot to keep you occupied and whilst a mission can feel the same as the one before and after it, there's some good action, a decent story and plenty of fun to be had here. I used to love scrolling down to reveal the score, but now it's right at the top. It kinda ruins it. Could you do a 'click to reveal score' button or something? Once again we have a game that should be on a handheld device, but instead it's on the gamepad where you will be stuck with in 15 feet of a Wii U. It's so strange that the GBA & DS's library are not available on the 3DS. The GBA games look great on a TV but with the limited screen options they give for DS games & some that are heavy touch or stylus based I can't imagine them selling many titles from that system's library. They should really add an option to switch the screens between the TV and the game pad, so you could have the main (bottom) screen on the TV, and the menu screen on the game pad. Sure, you couldn't use the touch controls that way, but the option would still be nice. Also, they should make the second batch of games (Explorers of Darkness/Time/Sky) available. They are not only easily the best games in the Pokémon Mystery Dungeon series, but the best Pokémon spinoffs overall. Are these better than Super Pokemon Mystery Dungeon? I really want to get into the series but I want to know more before I either spend 10 euros on an old game or 40 on the latest one. @Krisi Yeah, I've seen that demonstrated on the Nvidia Shield emulator. You just press in on the analog & it switches the top/bottom screens on the fly. @AyeHaley I'm fairly people most people will agree that these are not as good as Super PMD. The only ones that could challenge Super PMD are the Explorers games. Edit: Apparently, there are multiple German screenshots. I'm curious why that one screenshot seems to have a Pikachu with 499 HP. @RupeeClock Stats work completely differently in this game. All Pokémon can have a maximum of 999 HP, and 255 of all other stats. @AyeHaley I just started playing Super Mystery Dungeon, so I'm not sure yet. People seem to like Super Mystery Dungeon better, but I think I liked the first one's beginning better. However, the second game in the series (Explorers of Darkness/Time/Sky) is by far the best out of the Pokémon Mystery Dungeon games, and in my opinion, is the best non-mainline Pokémon game overall. @Krisi No I understand those mechanics completely, I've put hundreds of hours into PMD games. What I mean is the review screenshot clearly displays a Level 5 Pikachu with 499 HP. 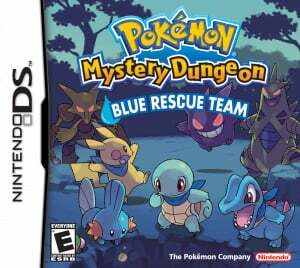 I like Roguelikes, but never really was too keen on any of the mystery dungeon games. SPMD has polished it mechanics a lot regarding the RRT/BRT but its story, in my opinion, doesn't match up to these first titles. It isn't a bad game by any means, but its beginning is too slow and its postgame is too short. But, as everyone says, Explorers of time/darkness/sky are the best of these spin offs. Just avoid Gates to infinity and you'll be fine. Super Mystery Dungeon really improved on a lot of the mechanics and I loved the story as well but I felt like there was a lot more depth in the "explorers" games. Also the dungeon sizes are different. The original games had much bigger dungeons (more floors) but they got really annoying because of that. Super mystery dungeon has got it just right in my opinion. Thanks for the advice, guys I'll check out Explorers of Sky and SPMD. @RupeeClock Yeah, well... Maybe I should have looked at the actual screenshot before saying anything.